Quick and simple way to add the new custom background selector to your WordPress 3.0 theme. Seriously. That’s it. Just add that to the theme’s functions.php file. Okay, so your theme does need to have the normal wp_head() call in it. For those of you more CSS inclined, this basically creates CSS code for the body and adds that code to the head output directly. Voila, your theme gets styled. Note that you will need to also not define your own background stuff in the theme for this to work. If the user tries to put in a solid color background and you define an image background, then the color won’t work or be visible over your image. Best to not put anything background related onto the body at all, in fact. Each of these are references to a callback function. If you use them, then you need to define your own callback functions to replace the default ones. The header_callback function is what builds and outputs the CSS. The function takes no parameters, but it can use get_background_image() and get_background_color() to retrieve the necessary information. From this information, the function should produce and output (echo) the necessary <style> block to show the image. The admin_header_callback function is called in the head section of the admin side of things; in the Background section to be specific. The admin_image_div_callback is similar, called immediately after displaying “This is your current background” on that page, where the image is displayed. If used, the admin_image_div_callback replaces the display of the current background image, so you custom callback should produce that instead. These two admin callbacks can be used to modify the Background admin page, to add custom text or information, etc. But generally, most themes won’t need this level of customization. Just add the basic code to the theme and the defaults are good to go. I’m tempted to try placing this in a file in the mu-plugins folder on a site with a lot of blogs.. er… a network with a lot of sites… and see if ti shows up on all themes. It should, so uber-cool if it actually works. Should work, but probably still best to enable on a theme by theme basis, since the theme could have styling changes that need to be made (removal of existing backgrounds, for example). Oh yeah, could totally lead to disaster too, and more MySpace-ification. I’m guessing there is a way to control how the CSS is displayed or perhaps a way to filter it so that you could add an !important declaration to the inline CSS to force it to over-ride the themes CSS. Although that wouldn’t work of course if they’ve laid a DIV tag over their background. My theme calls a background image on the body tag. If I enable custom background and set a custom background COLOR, but not a custom background image, it does not override (disable) my theme’s background image. Is there a way to make it add a class to the body tag if a custom background or color is set? 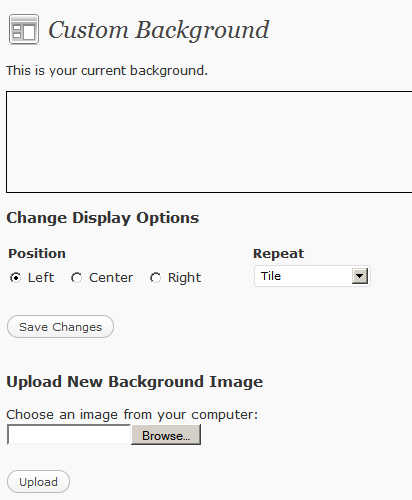 Using this additional class, I can disable my theme’s background image. Nice tutorial and explanation. Let’s suppose we don’t need this feature in our WP3 site using a child theme from Twenty Ten. How this function is disabled? I’m using WordPress and I want to change the background of the footer i.e. by uploading background image from the backend. How can I do it? I tried using the add_custom_background() function but it changes the background of whole body. I want particularly for the footer. You could apply it to any div of your template. I totally do not understand this #wrapper business, can someone please elaborate? website when I follow the instructions. Life Saver! That wp_call() should be underlined because it’s very important. Without it, the add_custom_background is not going to do anything. Thank you very much for your post! I know you are involved in WordPress development. It would be great to be able to set a default background image, like you can with custom header images. So simple to implement – thanks for that! Wondering though, is there a way to move the background color chooser to the same section as Background Image and rename it “Background”? I am using another section to control theme colors in general, and it is confusing to have multiple “Colors” sections.